Gael Monfils currently ranked as the World Number 7 is a French tennis player. It is considered one of the best athletes in the circuit. To know more about this French tennis player, read this full article. Gael Monfils born on 1 September 1986 in Paris, France. His father comes from the French island of Guadeloupe, his mother comes from the island of Martinique. His childhood was spent in the Paris suburb of Bobigny. He enthusiastically beside the tennis for the sport of basketball, but decided early on to a career on the ATP Tour, although he was considered a great basketball talent. 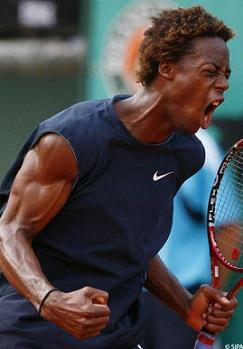 Monfils also played in his youth years in youth football teams. Since 2004, the right-handed professional with 16 years and won his first ATP point. At the junior world rankings, he finished 2004 as number 1 after the succession of youth soccer tournament in Melbourne, Paris and Wimbledon could win. In autumn the same year he debuted in a group of professional tennis, reaching the quarter-finals of the ATP Tour tournament in Metz. Monfils opened the 2006 season of the tournament in Doha , where he reached to the final. Match for the title he lost to Swiss Roger Federer. His best finish at a Grand Slam tournament when Monfils reached the Roland Garros in 2008 when he was with a win over David Ferrer pushed forward to the semifinals. In early 201 , at the Australian Open in 2011, he failed in the third round to Stanislas Wawrinka in the 2011 Wimbledon Championships Monfils came again, not beyond the third round and lost against Poland Lukasz Kubot. In the third Grand Slam tournament of the year at the Roland Garros in 2011, the Frenchman reached the quarterfinals on home soil where he, like the Roland Garros in 2008 against Roger Federer after 2 hours and 34 minutes with 4:6, 3:6 and 6:7 retired. To prepare for the currently taking place in U.S. Open 2011 he played with the Cincinnati Masters and the Canada Masters. In those two tournaments he reached the quarter-finals, where he respectively against the current No. 1 world tennis ranking, the Serb Novak Djokovic lost.